Because scenarios for slab lifting are infinite in the non-residential category, let’s lump Commercial and Industrial together. Concrete parking lots, showroom floors, industrial park walkways and an endless supply of huge warehouse floors are just the tip of the iceberg in this extremely lucrative field of opportunity. Last but not least, take a look in the transportation sector. The world is covered with miles and miles of concrete roads, highways, bridge approach slabs, and railroad support slabs. A large percentage of them have settled in one spot or another (and the rest are vulnerable to future settling). There will NEVER be enough slab lifting contractors out there to address ALL of these current and future slab lifting needs. Your fortune awaits...IF you know what you’re doing. It would be irresponsible to paint a completely rosy picture of the business and neglect to warn you of the pitfalls. 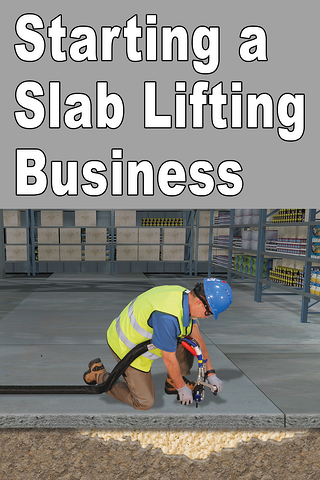 Risk is an underlying factor in any new endeavor, and slab lifting is no different. Threats of failure can arise from problems with your Equipment, your Lifting Material and your Technical Knowldege. You don’t want to wing it when you put your lifting rig together. Seek the advice of an experienced technician to make sure you have all the equipment you need, reliable machinery, and a trailer rig that was built to haul it all around. The last thing you need is a hose bursting, a generator failing or (and this has happened) a trailer axle breaking on the day of your first job! How would you like to spend your time working on jobs that actually pay? Using reliable polymers will cut way back on the chances you’ll have to load up your rig and waste a day re-doing a job you were paid for long ago. Here’s where it’s critical to partner with a knowledgable polymer supplier that cares about your success. Some who have gone before you failed at their new venture because they weren’t prepared to overcome common challenges that arise on slab lifting jobs. How do you deal with a slab that has fused to a wall or another slab and stubbornly refuses to lift? What about very small structures that easily leak polymer from underneath all sides without raising an inch? Then there’s the fun surprise of realizing the wrong side of your slab is lifting. You can also accidentally crack slabs, damage your customer’s proprty and - in the the biggest nightmare of them all - permanently overlift the slab. We can start you on the journey of total preparation for success in slab lifting. Our experienced technical consultants can educate you on the causes of settled slabs, the process of repairing them, and critical facts about the polymer material on which your jobs will rely. You'll learn about trailer rig options, the MixMaster slab lifting gun, pump options and accessory equipment. We also offer tips on markering your business, estimating materials for jobs, and essential techniques for avoiding on-the-job problems. To get started, call us today at 404-618-0438. Want info Alchemy-Spetec slab lifting products?